On Saturday, October 6th, 2018 The AOH and K of C from Clifton, NJ will travel to the Medal of Honor Grove in PA. Their yearly mission with the help hardy volunteers will clean up, restore and wash the NJ Memorial Obelisk and surrounding area of the New Jersey Medal of Honor Grove and the Military Chaplin’s Grove. Anyone interested in participating should contact John Hughes for more information. The 40th Annual Nutley St. Patrick’s Day Parade, took place on March 3, 2018 at 1pm. The parade route followed Franklin Ave from Harrison street to Chestnut street. 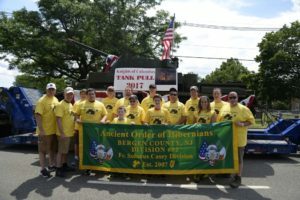 Rutherford Irish American Association will held its inaugural St. Patrick’s Day parade on March 4th, 2018 at 1pm. The parade route followed Park Avenue, starting at Woodland Avenue and going north through downtown to Ames Avenue. Along with five pipe bands, more than 25 organizations were committed to the inaugural year and received rave reviews from locals and visitors alike. The Division’s second event was again a big hit with plenty of new and old faces to enjoy the celebration with fun. music and good food. Corned Beef and Cabbage along traditional sides of Carrots, Potatoes, Bread, Beer and wine. Live Music was provided by “The Captain and O’Neill” and the feedback was amazing. The next Halfway event is planned so please mark your calendars for October 13th, 2018 and spread the word. The Passaic Division 16 Team came up big this year winning a 3rd place trophy for the fastest pull with a time of 6.94 sec. Congratulations to our team! AOH also placed 2nd in the Lowest Combined Weight of 136.5 lbs. with a time of 35.25 sec. (Female). 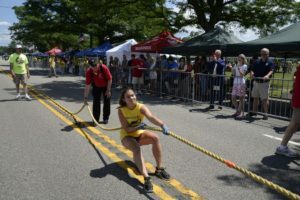 AOH Bergan 32 were also on hand to support the cause and were no slackers with a quick pull time as well! On Saturday, April 8th, 2017 The AOH and K of C Tank Pull Board of Directors from Clifton, NJ traveled to the Medal of Honor Grove in PA. The mission of the trip was accomplished when the hardy volunteers helped clean up, restore and wash the NJ Memorial Obelisk and surrounding area of the New Jersey Medal of Honor Grove and the Military Chaplin’s Grove. It was a cold day for the AOH brothers, but not to be deterred we stood proud with the rest of participants and the cheerful crowd who lined the streets clad head to toe in warm clothing! 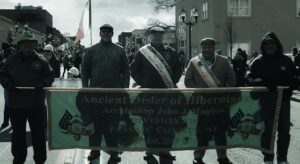 The National Ancient Order of Hibernians in America celebrated the Centenary of the Easter Rising in New York City on April 23, 2016, with a Mass at St. Patrick’s Cathedral. A piped procession followed from the cathedral to the Consul General. The Consul General of Ireland in New York, Ms, Barbra Jones, Ambassador of Ireland to USA Ms. Anne Anderson welcomed all and provided opening remarks followed by Government of Ireland Representative Mr. Alan Kelly. Fr. Gary Donegan was on hand from Holy Cross Monastery in Belfast for the Prayer of Remembrance followed by a Lament played by Sergent John McGuinn, Piper of the Irish Defense Forces. A beautiful rendition of Danny Boy was played on the violin by Ms. Heather Martin Bixler. There was a reading of the Proclamation by Captain Peter Kelleher of the 27th infantry Battalion, Irish Defense Forces and then Minstrel Boy played by the Ancient Order of Hibernians Bands. After Reveille was played by Bandswoman Jane Hillard, Bugler and Corporal Robert Matthews, Drummer, Irish Defense Forces the national anthems were sung by the Hibernian Festival Singers. 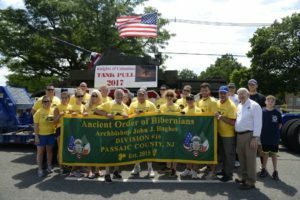 The Ancient Order of Hibernians in America is an Irish Catholic men’s organization which was originated in the United States in nineteenth-century New York City by Irish immigrants who banded together in protection of the Catholic Church. For those men interested in joining our Division, please follow the below membership link and when submitting mention your are applying to join Passaic Division 16 so it can promptly forwarded to us.